Amplifon asked us to design a service to help their customers easily master using a hearing aid and fully enjoy its capabilities. 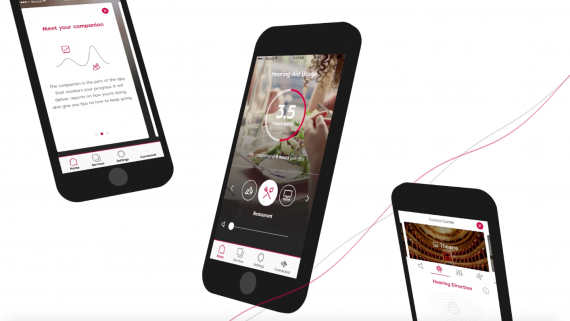 The service was to provide complete control of hearing aids on a mobile via Bluetooth and connect to and control devices from almost all key manufacturers, with consistent UX and UI. In tandem, it needed to offer a pro-active digital companion that intuitively helps users learn how to get the most out of the service. A front-runner in technology, it is the world’s first hearing aid app to connect to any Bluetooth hearing aids in the market. An AI ready companion service that actively helps customers overcome new and difficult challenges they face, giving daily reminders, real-time feedback encouragement, and offering unparalleled technical support, including tutorials and FAQs. The companion service guides and supports customers, encouraging them to use their hearing aids to their greatest potential every step of the way. The app also supports customers to help them regain optimal hearing thus improving their quality of life. It allows customers to manage volume control, noise levels, wind reduction and more, in restaurants, when listening to music and in the outdoor environment, from a single central control panel. Customers can also locate the nearest Amplifon store and book appointments directly using the app. Amplifon’s core target group of older customers who live an increasingly more active, digital lifestyle. Customers in search of hearing health solutions, Amplifon customers family and friends, key influencers and people suffering from hearing impairments. Overall, we have been working on the Amplifon app for over a year and a half, with approximately half a year in an especially intensive, agile development phase. The project has been designed by a team spread across Milan, London, and Cologne with a third-party development team from Rome. During this time, we have developed the detailed specification, all screen designs, a complete visual identity, custom iconography, and branded motion design, all based on extensive user research and service design work. With the Companion, we have designed a unique, digital service. In addition, we are responsible for the creative direction of all content that is being produced for the app. Currently, we are developing new features and enhancing the app, which will make it even more valuable for customers. This app is a crucial building block of Amplifon’s digital transformation strategy. It helps to attract a new, younger generation of customers. And it satisfies the changing needs of Amplifon’s core target group of older customers who live an increasingly more active, digital lifestyle. Finally, it also underlines Amplifon’s position as the leading hearing care service provider by enabling new, digital services that enrich the overall customer experience, especially after-sales, and will ultimately increase customer satisfaction. The app has been downloaded more than 3800 times in a period of 4 months since its launch. On the day of the launch, Amplifon shares rose 10%.